On Monday, Oct 1, the LBHS Boys Water Polo team faced off against Dana Hills High School for their Senior Day showdown. Before the action, coaches, fans, and family honored the three seniors: Matthew Blunk, Will Clark, and Colton Gregory. Following a short speech about each senior and a quick photo shoot, play began. Dana Hills took a quick one goal lead early in the first quarter, and the Breakers did not have answer until late in the quarter. After a tied first quarter, the Breakers took and held the lead for the remainder of the game thanks to goals by freshman Logan McCarroll, junior Zachary Cord, senior Will Clark, and senior Colton Gregory who finished with a game high four goals. Stellar play from junior goalie Caden Capobianco kept the Dolphins offense at bay. The Breakers survived a late push from the Dolphins and hung on to win by a score of 8-7. The Breakers followed up their Monday victory with a much-anticipated league matchup against the Huntington Beach Oilers on Wednesday, Oct 3. The Breakers defeated the Oilers during the ninth place game of the South Coast Tournament just two weeks ago by a score of 13-11. The Breakers came out hot taking a 6-0 lead early in the second period thanks to goals by freshman Will Kelly, freshman Logan McCarroll, junior Zachary Cord, senior Will Clark, and senior Colton Gregory. The Oilers kept the game close with a few offensive surges throughout the game, but failed to break the Breakers defense. Thanks to huge shot blocks and saves by Capobianco, including a five meter penalty block in the fourth, the Breakers managed to take the win by a score of 11-7. The Breakers are back in action this Saturday versus San Clemente High School at Vista Hermosa Aquatics Center. The Laguna Beach High School Scholarship Foundation recently held their Third Annual Emeritus event to honor those persons who have made significant service contributions to the mission of the foundation. Among this year’s honorees was Lee Kucera, who served as Foundation President from 2001-2003 and worked as a board member until 2014. Lee is a retired teacher and currently serves as a national grader for Advance Placement math examinations and teaches at UCI. Also honored, Jan Fritsen was hired in 1968 as a counselor at Laguna Beach High School. Jan took it upon herself to expand the scholarship awards from the handful that existed in the 1960s to help create the long list and variety of awards that we see today in our scholarship foundation. Alex Alpert was honored (in memoriam) as a local resident with no children in the school system who joined the foundation in 1988. She was an active member for ten years and worked hard to expand the college scholarships available to students. Victoria Strombom, a local realtor with Surterre Properties, has been a director since 2011 and was honored for her work with a number of scholarships and increasing the rporation and in 2018 awarded $429,763 in 340 scholarships to 140 deserving graduating seniors from funds provided by 139 sponsors. To help create an award, add to the existing grants or help the foundation – contact Lynn Gregory, Scholarship and Financial Aid Specialist at (949) 497-7750 ext. 1212. LBHS Football secured another big road win on Friday, defeating Marina High School, a school more than double its size, 21-18. With the win, the Breakers improve to 5-1 on the season (their only loss was to defending CIF champion Big Bear). Nolan moves up to 4th all-time on receiving TDs with 10 (the school record is 19), while Johnson, who threw for 230 yards total and earned a QB rating of 144.0 on the game, moved up into 5th all-time for TD passes in a season with 19 (the school record is 260). This Friday the Breakers will host Rio Hondo Prep (4-1) in an exciting matchup at home for Homecoming. Kickoff is at 7 p.m. If you are interested in who decides policy for our local public schools, come hear from all six candidates running for three open seats on the Laguna Beach Unified School Board at a public forum on Thursday, Oct 4, from 7 - 8:30 p.m. at the Laguna Beach High School Artists’ Theatre, 625 Park Ave. 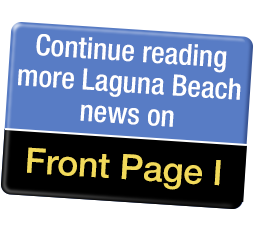 This impartial and nonpartisan candidates’ forum is presented by the Laguna Beach Unified Council of PTAs in cooperation with the League of Women Voters of Orange Coast. The forum will be moderated by Gisela Meier from the League’s Central Orange County Area Chapter. Doors will open at 6 p.m. to begin accepting written questions from the audience. The format will feature opening and closing remarks from each candidate, with questions asked by the moderator. All candidates have agreed to participate – Dee Namba Perry, James J. Kelly, Carol Normandin, Mark Nelson, Christine De Bretteville, and Howard Hills. PTA is the nation’s oldest and most respected all-volunteer organization advocating on behalf of children, youth, and families. It is nonpartisan, noncommercial, and nonsectarian. The League of Women Voters, a nonpartisan political organization, encourages informed and active participation in government, works to increase understanding of major public policy issues, and influences public policy through education and advocacy. Editor’s note: candidates are listed in ballot order as determined by the Secretary of State’s randomized alphabet drawing. Have you been “Flocked?” Perhaps you’ve spotted these persnickety pink polo birds roosting on lawns throughout Laguna Beach over the past several weeks. They’ve been sent in an effort to raise funds for the Laguna Beach High School Boys Water Polo team. If you were one of the lucky residents whose lawn was a temporary roosting spot, the LBHS Boys Water Polo team would love for you to share with them on social media. You can find the team on Twitter @LBBoysPolo, Facebook @LBHSBoysWaterPolo and Instagram @lbhs_boys_waterpolo. Use the hashtag #ivebeenflocked and post a photo on your wall if you have one. LBHS Boys Water Polo thanks the community for your support. Go Breakers! LBHS has more than 200 students joining the ranks of newly registered voters-to-be thanks to the efforts of 12th grade social studies teachers Mark Alvarez and Jonathan Todd in promoting civic engagement. Each year, PTA provides voter registration packets to high school seniors in their LBHS US Government/Economics classes to educate students about their rights and responsibilities when they turn 18 and encourage them to register or pre-register to vote (students who are 16 or 17 years old may pre-register and then vote when they turn 18). “It was pretty easy to register,” said high school senior Drake Fay. “The ‘When You Turn 18’ guide has some really interesting and useful things in it.” The guide is published by the California Bar Association. To help develop good citizens, the teachers incorporate civics education into what they teach students every day. “After studying the Constitution, registering to vote reinforced the principle that our government is truly ‘for the people’ and ‘by the people’,” said Todd. On Wednesday, Oct 3, families that are new to LBUSD are invited to attend PTA Coffee Talk’s “New Families Welcome Tea” at The Old House Garden Cafe from 8:30 -10:15 a.m. Longtime residents are welcome to join in to help welcome the new families into the community. This is a chance for new parents to meet other families that are also new to the district. Parents will get to know more about the schools are our charming town. Light refreshments will be served. To reserve a free seat to the Coffee Talk, visit www.ptacoffeetalk.org. Old House Garden Cafe is located at 320 North Coast Hwy. LBHS Football earned its first road win on Friday, dominating Estancia High School 41-6. The win marks the third straight victory by the Breakers over the Eagles. Shane Lythgoe rushed for 101 yards, scoring one of the Breakers’ 5 TDs. Milestones on the game included Nolan moving into a tie for #2 on LBHS’ all-time career catches record list with 117, tying Eric Fegraus (1989-91). Nolan is also 4th in career yards for the Breakers, and 2nd in career TD catches. This week, LBHS Football takes on Marina (2-4) in another away game on Friday, Sept 28, at Westminster High School. Kickoff is at 7 p.m.
LBHS Boys Water Polo participated in the South Coast Water Polo Tournament in Newport Beach this past weekend. The Breakers competed in some very high-level matches against powerhouses Newport Harbor and La Jolla’s The Bishop’s School. Marshall Eichenauer III scored four goals in Saturday’s victory over Huntington Beach, 13-11, which earned the team a strong 9th place finish in the tourney (its best finish since 2010) and its first win over HB since 2008. James Nolan and Zach Cord each scored three goals for the Breakers (8-6), while Colton Gregory had two goals and three assists. Will Clark had a goal and four assists, while Caden Capobianco made eight saves. Laguna Beach also beat Corona del Mar 11-10 in overtime in a ninth-place semifinal earlier Saturday. Freshman Logan McCarroll scored the game-winning goal on a penalty shot and led the team with three goals. Gregory and Clark each scored twice, and Capobianco had 10 saves and five steals. The Breakers return to Surf League play on Wednesday at Newport Harbor in a re-match against Corona del Mar at 7:30 p.m. If you are interested in who decides policy for our local public schools, come hear from all five candidates running for three open seats on the Laguna Beach Unified School Board at a public forum on Thursday, Oct 4, from 7 - 8:30 p.m. at the Laguna Beach High School Artists’ Theatre, 625 Park Ave. The format will feature opening and closing remarks from each candidate, with questions asked by the moderator. All candidates have agreed to participate – Dee Namba Perry, James J. Kelly, Carol Normandin, Mark Nelson, and Christine De Bretteville.